Day 248: Parlay This Into . . .
Mondays — as previously noted in this space — are not the best days of the week. Coming off a relaxing weekend, Mondays just seem to get in the way of a good night’s sleep and a desire to NOT go to work! After taking in the finale of The Amazing Race and Chopped All-Stars on Sunday evening, a short-night’s sleep turned into a long day’s work. While this is not out of the ordinary, this week it takes on some significance because it’s a very busy week. Probably the single biggest event since our marriage and birth of the girls takes place this weekend with Daughter #1’s graduation from college. Yes, we know it happens everyday in America, but for the past 22+ years, it’s always been someone else’s child! This weekend–that all changes! We get to join our siblings’ whose children have graduated from colleges and gone on to careers, more education, a better life. . .it happens with the blink of an eye. Probably more significant than birthdays, graduations cause us to focus on milestones. . .and the reality that we’ve done our job. We still shake our heads because this child was really born yesterday. So what’s transpired between yesterday and today is the stuff that miracles are made of! Yes, life is a miracle and seeing a child achieve a goal as lofty as a college education in FOUR years is the stuff legends are made of! We’d like to think that she’s parlayed a strong upbringing into a lifetime of potential and optimism. With her sister not too far behind, we continue to be amazed at the gifts bestowed upon us and never take either of those gifts for granted. It’s moments like this that cause all of the strife of the world–the challenges of our daily lives–and the potential that lies within all of us to take a back seat to the reality of achievement. As two former SFA Lumberjacks–together with a multitude of family members who also call SFA their alma mater, we salute OUR LUMBERJACK—Axe ‘Em Jacks! You’ve done VERY WELL! 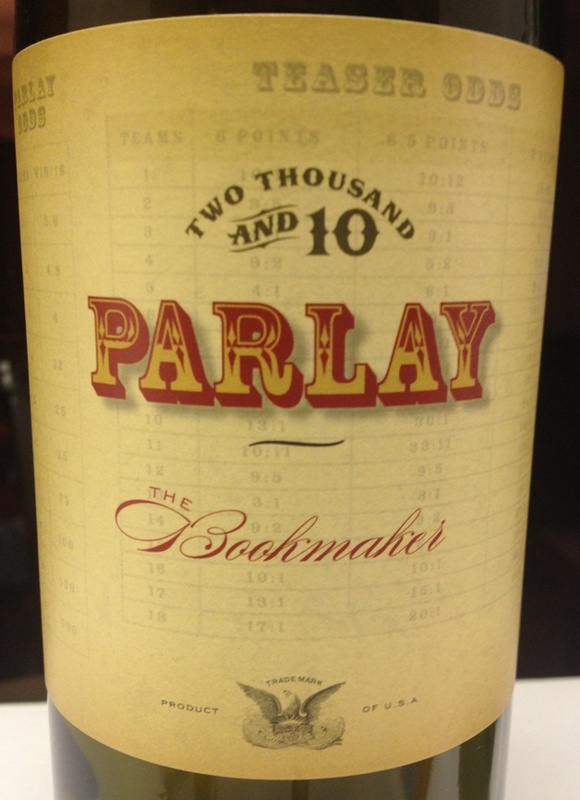 And, tonight because the Kentucky Derby may be a gamble but an education is a SURE thing, we opened and tasted a 2010 Parlay blend from Ramian Estates in Napa Valley, California. As long time sportscaster, Keith Jackson used to say—“WHOA NELLIE”–this wine caused us to stop in our tracks. This is a big bold, in your face (in a good way) wine. There are licorice, boysenberry and dark cherry flavors; with the Petite Sirah not being a shy component of this blend. The finish is long and lush with dark fruit still present. Tannins present give this wine a bit of earth on the finish. Served with grilled bone-in pork chops and garlic mashed potatoes, this wine worked well as dinner wine–it would have been just as fine without dinner! At around $18 a bottle from our local H-E-B, it’s a good value wine for the money. Yes, there are better wines for more but if you’re on a budget and trying to stay under $20 a bottle, but you want something with some body, flair, style and taste, then this is your stopping point! From the nose to the finish, this 2010 is a gem hidden among larger than life labels that can’t deliver the flavor. We’d suggest you buy two! Like almost every wine we’ve sampled and blogged about over the past 248 days, we have purchased and sampled on our own. We haven’t been jaded by anyone asking us to write about their wines and plied us with bottles of free juice. . .we are still tasting and writing from the heart…the way it should be. Even as we celebrate a milestone of one of our children, we stay true to our wine roots and shop our local retailers with the goal of finding gems for sampling–reasons to shop wines that are delicious, affordable and ready to enjoy. We hope that you celebrate your family’s best moments–whether it be graduation, a wedding, a bar mitzvah or whatever is important in your world. Celebrate responsibly with your favorite wine and always remember to recycle. Categories: Uncategorized | Tags: Lumberjacks, Parlay Blend wine, Ramian Estates | Permalink.